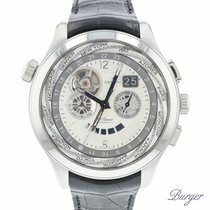 Grande name - Grande class and one of the finest timepiece in the watchworld, and perhaps the best one money can buy. Swiss watchmaker since 1865 it definitely has history and pedigree to stand next to the finest brands. But their lucky star was born in 1969 with the birth of El Primero powerplant. The best chronograph engine ever created. - Last and not least this is open heart model to see the 36,000 BpH at anytime through the dial one wishes for. 46mm diameter steel case on black crocodile leather, butterfly double deployment clasp with big star.